Not much makes me happier than a book. And a book about books and storytelling is likely to make me do a little happy dance. I came across these stunners in my local children’s book shop Bags of Books. I was looking for some great books to add to The Rainbow Library for International Book Giving Day. I grabbed these with glee. Books about the power of books… for IBGD… perfect! 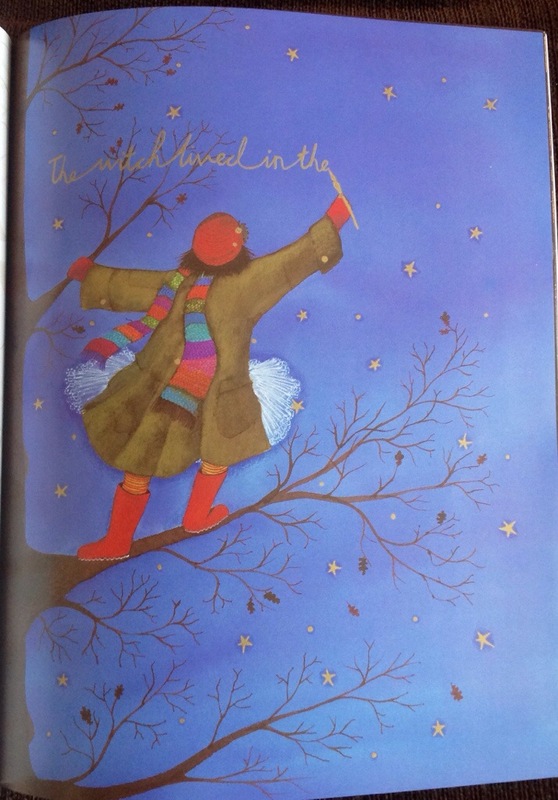 Deceptively simple, this book beautifully shows children how they can be their own story makers. Elliott finds a typewriter and, not knowing what it is (what young child would?) he experiments with it and finds that it is a story maker. Not through typing words – Elliott isn’t good with words- but by making pictures with the placement of the typed letters. Elliott finds that he can tell his own stories. He is a story maker. And he is really very good at it. This book is acknowledging the importance of children’s creativity. It is showing children that the book in their hand is no different to the painting they just made. That they are artists and storytellers too. What a lovely concept; that you can tell stories in whatever way suits you and everyone can be a story maker. But in reality, I don’t think children need a book to tell them that. They are innately creative and uninhibited. It is only with age that we lose that creative freedom. Sit in any reception classroom and you will see children being storytellers – through writing, drawing, telling a story through the cars they are pushing across the floor, or just by running round in a circle singing at the tops of their voices. It is all play and all play is story. Perhaps it is more likely that this book is reminding the adult of their own creative potential and of the importance of acknowledging their children’s creativity. Perhaps this book isn’t for children after all. Perhaps I will keep hold of it for myself, just for a while. I am a fan of Thomas Docherty’s work and instantly recognised his style from The Snorgh and the Sailor and The Driftwood Ball. I love the way he uses colour to bring light and life into his pictures. Combine that with a story about a Snatchabook and I’m there! And, oh! This book! It really is delicious! You’re hooked already, aren’t you! I certainly was. Burrow Down! And a female animal character! The story develops as all the books in Burrow Down begin to vanish. The animal inhabitants are not impressed and Eliza decides to catch the thief in action. With a pile of book-bait she lays in wait and discovers the Snatchabook. The cutest creature you could imagine. I really want one to sit on my bookshelves! The poor Snatchabook just wants someone to read him a bedtime story. Luckily, Eliza understands the importance of bedtime reading and steps in to help. ‘Eliza sighed. He looked so sad. The illustrations have a beautiful luminous quality to them and are full of detail for little ones to enjoy. Beautiful. 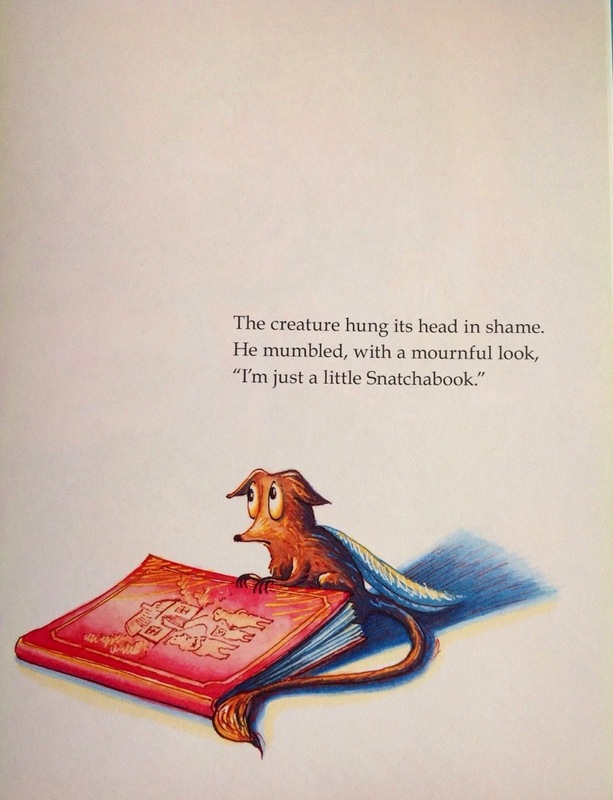 A really special ode to the power of the bedtime story, The Snatchabook is perfectly pitched to appeal to children and the adults reading to them. I’m not ready to give this one up yet. I might have to read it just a few more times. For older readers, The Lost Happy Endings by Carol Ann Duffy and Jane Ray (Bloomsbury) is stunning. Carol Ann Duffy’s text is beautifully lyrical and deliciously inventive – ‘when dusk was removing the outline of things, like a rubber’ Jub carried a sack of happy endings and scattered them in the air for the children’s bedtime stories. The next morning the happy endings had flown back and were hanging in a tree to be collected and sent out again that night. But when a witch intercepts Jub and steals all the happy endings, children’s stories become terrifying and sad. With a little bit of fairy tale magic, Jub tells her own story within a story to rescue the happy endings and put everything right. Definitely one for older readers, this is a much longer text than usually found in the picture book format and contains description of the witch burning to a pile of ashes. I wouldn’t read it to my 4 yr old yet, but highly recommend it for older children who are moving on to longer stories. I love its story within a story and its celebration of the power of words and storytelling. A wonderful idea beautifully told, perfectly matched with Jane Ray’s magical haunting illustrations, The Lost Happy Ending is a keeper. Dog Loves Books by Louise Yates (Random House and I love dog! This is a duplicate copy bought specifically for the library. You can read my review of the delicious Dog series here. 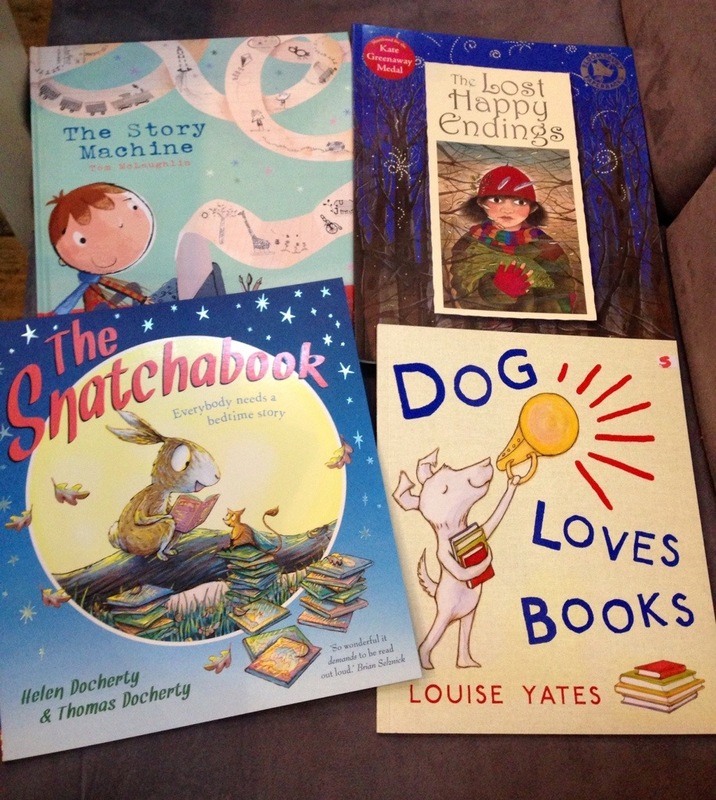 Hmmm… Only one out of the four actually made it in to the library – I may have to go shopping again! All purchased at my lovely local bookshop, Bags of Books. Where’s Lenny? The perfect book for a nursery. All goodies! What a great choice you made.